Dr. Young’s small-town approach to personalizing dental care ensures that all patients receive the high-quality care they deserve. Dr. Young began his collegiate career at Louisiana State University at Eunice, where he studied basic science and nursing. He then moved on to Louisiana State University at Baton Rouge to pursue a biochemistry degree with the intent of applying to dental school. Dr. Young began his dental education at Louisiana State University (LSU) School of Dentistry in 1999 and graduated in 2003. 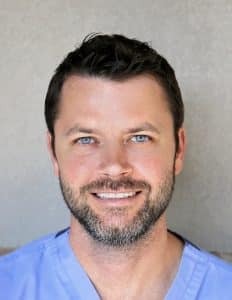 He worked as an associate dentist and completed many hours of continuing education, including training in dental implants and cosmetic dentistry. After two years as an associate dentist, Dr. Young opened his own dental practice in 2005. Dr. Young loves helping his patients and developing a relationship with them. He is committed to education and treating every patient as a guest in his home. His goal is to provide the highest quality patient care with the latest technology, while still maintaining a small, hometown experience. Dr. Young is the youngest of six and the only boy in his family. He is a proud, long-term resident of Acadiana, and he completed high school in Chataignier, LA in 1994. His work ethic and sense of business were sharpened by hours spent “running the traps” in family crawfish ponds. Dr. Young has four children: a boy, two girls, and one stepdaughter. His hobbies include basketball and playing guitar. Dr. Young is a member of the American Academy of Dramatic Arts (AADA), as well. His favorite movies are Goodfellas and Braveheart. Dr. Young’s wide range of experience, compassionate team, and investment in advanced technology help ensure that all of our patients receive the personalized, high-quality dental health care that they deserve. To learn more, schedule a consultation with us by calling the office of Michael J. Young, DDS, in Lafayette, LA, today at 337-237-6453.